We wanted send out an alert on FBCD this morning, if for no other reason than the fact that it’s been quite awhile since we found a bottom play trading near all-time lows in the super-subpenny range. We’ve definitely been known to do some bottom-fishing in our day, with some of our biggest wins coming from bargain shopping. What we have in FBCD is a stock that has been beaten back to a record low of .0005 (reached yesterday) which catches our attention in a big way. We are going to stay vigilant as we monitor this play for a solid bottom, because a snapback to to the double-zero range is not only very possible, but also has the potential to happen quite rapidly. With so little room to the downside, one might classify FBCD as a “lottery ticket” type of play. The action on super-subpennies have the potential to return exponential gains, which is why we’re going to give it a spot on our running watchlist. We were passively tracking HEB via our extended watchlist last month, and are going to keep giving it our attention as the new quarter kicks off today. The stock is gapping up to the tune of roughly 25% in the premarket. We caught notice of HEB following the company’s announcement that it would collaborate with US Army Medical Research to develop treatments to attempt to overcome the emergence of drug resistance due to Ebola virus mutation. With the current Ebola breakout making it a hot-button topic, and the company stating this week that it would be expanding its Ebola research, we’re going to still be keeping our ears to the ground on this one. SPEX made an appearance in yesterday morning’s extended watchlist and had one heck of a solid session. The stock came out of the gate and ran from a low of .99 all the way up to 1.58, offering us the chance to bank up to 60% in profits as it traded more than 13.5X its 3-month average volume. Disappointment over the delay of some upcoming litigation that Shperix has against VTech and Uniden (View PR) is the apparent cause of the stock’s gapping down in today’s premarket. FBCD – FBC Holdings, Inc. | EXTO – Exit Only, Inc.
FBCD provided an opportunity to see a 40% intraday gain on Friday, opening at .01, and hit a high of .014 on seven times its average 3mo. volume. This comes on the heels of an influential PR released post-market on Thursday. We like the current MACD indicator, as it is converging quite sharply toward a cross; that leaves us bullish on FBCD. Last week, we were calling for a MACD cross on the EXTO chart, and it transpired just as predicted. The stock is in the early stages of yet another uptrend; the last run took us to gains of over 400% in under a three-month period. We are very interested to see how EXTO fares on this particular swing. Remember, we are always on the lookout for new picks, and if any of our readers would like to suggest one, feel free to reply with your recent activity. If it measures up, we’ll put it in the newsletter. CNUV was a good momentum alert yesterday, and it looks like the party just began here. The stock opened at .0028, hit .0031 for an 11% gain, before dipping to .0024 only to turn around to see a run to .0033; a 30% intraday gain. While the stock closed down 10% on the day, there were plenty of opportunities to turn a quick profit by flipping this one. Maintaining the kind of volume we saw in the previous two days should keep CNUV in line to see even more possibility for profit. China Nuvo Solar Energy, Inc. Announces Third-Party Distribution Agreement With Bluewater Surgical, Inc.
We have been trying to sniff out a bottom on this past pick. FBCD has been on the back burner for awhile, but has made huge gains for us in the past. The company had news out post-market yesterday, the first time we’ve heard from FBCD since September, and this PR could be just the catalyst needed to bring this stock up off of its bottom. 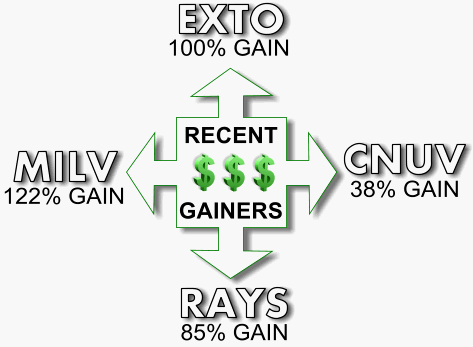 EXTO has been one of our favorite stocks this year, and continues to give us cause for our continual support. Yesterday EXTO closed with authority at its high of day, up 26% on the day, and more than 100% from last week’s bottom. Earlier in the week, we pointed out the impending MACD cross, and it appears as if it is now kissing; we should see that cross today. EXTO is one of our longer-term plays, and proof that even on the penny markets, there are those stocks whose activity makes it easy to stick with. EXTO was prime for a revisit, and we once again picked the right time. The next levels of resistance here are .009 and the previous high of .0129. We are confident that these highs will be retested, which would represent a gain of 50% from the current price. A move past .0129, and the sky’s the limit for EXTO, we could be seeing new highs in the weeks ahead. DGHG has been on another slow and steady uptrend, up over 20% since our recent outlining of the company’s exchange uplisting. It’s great to see a company graduate to the next level, and DGHG reached that sought-after achievement, bringing our confidence level in the stockto an all time high. The previous high of 1.28 is just a few ticks away, and past that, it will be amusing to see where DGHG encounters a patch of resistance. Those of you that have been with us since the beginning of the year, would recall HLLXF as a huge performer, having ran from the .40-.50 range in the spring, to as high as 1.65 on Sept. 21st; that’s 300-400% in gains. Since then, we saw a retrace to a low of .65, and has gradually been inching up from that bottom. We have confidence in the stock at its current price level, and believe that a break back into 1.00 territory could happen fairly easily, especially if we hear positive results back on the company’s drilling program. Current gold prices continue to trend up in this uncertain global economy, another factor which plays right into HLLXF’s wheelhouse. We heard a lot about RMDT over the weekend, so we thought we’d mention it as a momentum play this morning. This stock made a nice move last week, and we like stocks in the half-penny range for just that; their ability to rack up quick gains. At present, the RSI is in the powerzone, and a breakout could indeed be underway. This is an interesting company operating in a field that we generally don’t hear much about; electronics recycling. They also have an all electric vehicle made from mostly recycled materials. Their website is worth checking out. RAYS figures to continue its momentum from last week, closing at a 1.58. From our original alert price of 1.34, the stock maintained a 15% increase. The stock is now just a week old, but already, due to heavy promotions, Raystream is now a name that is on everyone’s lips. We ought mention that we are not one of the groups running paid promotion on RAYS, but we are one of the first groups to mention it, seeing the weight behind its promotion budget, as well as a fine product. One could say it’s rare to have such a new stock hold so much promise, but the ramifications of streaming video data speeds of up to 90% faster than current standards, are far reaching indeed. It is going to be awfully interesting to see how the company fares in its attempts to introduce this technology to the mainstream. FBCD has been shaping up nicely after our bottom call just over a week ago. After rising 70% for us, the chart is pulling back slightly and seems to be preparing for another bounce. These recent gains represent only a scratch of the surface compared to some of the gains that FBCD has provided in the past, which is why we always like to watch this stock closely. It has the ability for monstrous gains, as proven back in May, running over 600%. JVA has been in the green for five out of the six days that we have covered it. We jumped on the JVA bandwagon at 8.35, and enjoyed 77% in gains as the stock hit 14.77 on Wednesday. This stock trades fairly predictably. We like the ability of the stock to provide these short term gains, however, we are also excited about its potential value for the long term. Remember, this was a $20+ stock just a couple of months ago, and a return to that level is not out of the realm of possibility.